So I was invited by boss (Brad) to jump on his Baymaster 1850 and hit the salt. So we loaded up and launched at 6:30 in safe-light conditions. The boat parade at the Pompano boat ramp was in full effect as usual on a Saturday(This is the long queue of boats waiting to launch). With over-cast conditions we hit the Holly Beach area first and fished the East side of the big island. After getting a solid bite we were ambushed by another boat that came right by us completely shutting down the bite.How I despise uncourteous and ignorant boaters. With so much bay you would figure they would give each boat some space but oh well. So we moved the the North side and started catching under-sized trout. After 10 dinks we moved to the shore-line to sight cast at some Reds. With nothing but Horse Eye’s we skipped over to the East-side of marker #97 and drifted towards the color change before the drum boat. We caught trout after tout doubling up at times. The trout we schooled up hard and feeding very aggressively. Everything we threw got strikes including top-waters. 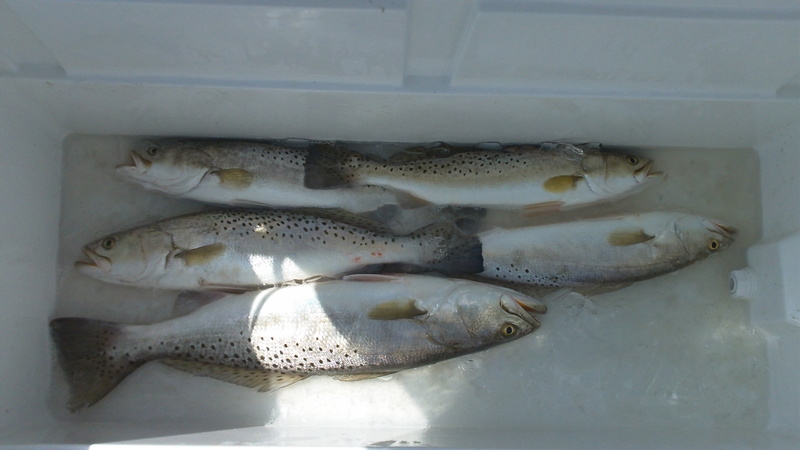 Unfortunately the majority were under-sized but we did manage to get some keepers. Brad out fished me with a popping cork rig but I did land some trout on a Super-Spook Jr. in Redfish pattern and some keepers on a KellyWiggler ball tail in purple and chartreuse. Got back to the dock and had some dude named Rambo clean the fish. This guy was a pro and only charged $1 per fish. Just enough to buy himself a 6pack. Give him a call if you need your meat haul cleaned!